Here we go- my latest batch of reviews for movies that have come out this year. Notice I pretty much see everything on a 3-4 month delay, but now that fall season is here, these may be coming a bit more frequently, as the slate gets pretty full over the next few months and there’s a lot more to catch up with. Enjoy these reviews, all but one of which, I’ve just realized are sequels. Yikes. It’s strange how so many Star Wars movies can be so unsuccessful in so many different ways. I haven’t liked the prequels, the reboots or the spinoff movies and all for completely different reasons. You can add this latest Han Solo origin story to the list, because I’ve rarely seen a film so desperately searching for a reason to exist than this one. After a troubled pre-production and original filming stage, Ron Howard was brought in to replace directors Christopher Lord and Phil Miller, and basically reshot the entire movie from the very beginning. Yet you can’t tell from the way it was put together that it suffered production problems- this is a fairly competent film, technically. But the story is so dreadfully dull and pointless that it ceases to hold any interest in what’s happening onscreen, no matter how many perfunctory action scenes enter the story at the prescribed moment. Alden Ehrenreich plays young Han Solo and doesn’t hold a candle to Harrison Ford (who is the reason Han Solo is a beloved character to begin with), most unfortunately in terms of screen presence. He tries, but often fades into the background of his own movie, and not because the other actors are so much more dynamic. His inability to hold the screen aside, this is a boring story about a guy who wants to be a pilot and drifts into a smuggler gang led by Woody Harrelson, meets Chewbacca, meets Lando, likes a girl, and obtains the Millennium Falcon, which I guess is all anyone wanted to see, but there’s so little energy or interest in any of the scenes comprising these mandatory events. No memorable action sequence grabs your attention, despite there being quite a lot of them (it feels like the movie knows its characters aren’t interesting enough to watch them talk for too long before being attacked), a terribly bland romance sees zero chemistry between Ehrenreich and Emilia Clarke as his hometown love interest, and not even Donald Glover’s obvious Billy Dee Williams impersonation brings any life into this script. At 2 hours and 15 minutes, it feels at least an hour longer and you wonder when this endless, lifeless, generic action movie (which would hold NO interest if you didn’t already know the names of these characters) will come to a merciful end. 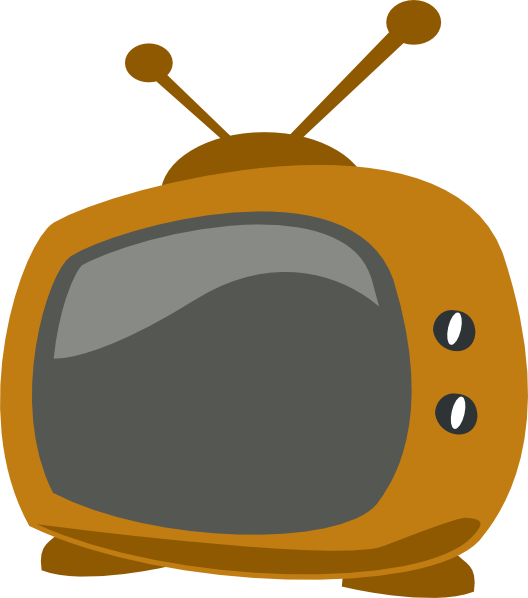 When it finally does, you know that you’ll never watch it or think about it again. You wouldn’t think an all female spinoff of the Ocean’s series would necessarily feel like something the culture needed, but while its necessity is questionable, it runs smoothly and entertainingly enough to make me glad I watched it anyway. After all, what were the Ocean’s movies in the end, but slick, easily digestible surface entertainments with no deeper layer to them aside from Steven Soderbergh’s tinted cinematography and some snappy dialogue? Cinematography aside, this is an easy companion piece to those films, and is probably better than two of them. Sandra Bullock stars as Debbie Ocean, sister to George Clooney’s now inexplicably deceased Danny, who is released from a five year stint in prison and wants to pull off her own heist. With fellow thief Lou (Cate Blanchett, sort of filling the Brad Pitt role), she plots to rob the Met Gala of some rare jewels, in particular an out-of-the-vault, $150 million diamond necklace to be worn on the neck of a pampered celebrity (Anne Hathaway, in one of her better cast roles). The film then follows the familiar Ocean’s formula of planning and executing the heist, but it’s done with a likable cast including Helena Bonham Carter, Sarah Paulson, Mindy Kaling, Awkwafina and Rihanna, and planned with a such a light, fizzy, air of fun surrounding every step that you’re carried through to the end, especially if you happen to be into the fabulous fashion and glamour that crowds the air at a red carpet event like the Met Gala. It’s unapologetically geared towards women and women’s tastes, without once condescending to its audience or basking in the annoying smugness of the actors (a problem that has occasionally plagued this franchise in the past). It may not have a deeper meaning to it all, but as far as all female reboots go, this one is far more successful than say, the recent Ghostbusters. I enjoyed it. 2015’s Jurassic World was one of the loudest, dumbest blockbusters I’d ever seen and the sequel pretty much follows its predecessor’s tone, although with new director J.A. Bayona (The Orphanage, The Impossible) it’s mercifully devoid of the kind of shameless nostalgia that invoked every frame of the last movie. This time it’s pretty much just a straight generic follow-up with dinos roaming around, attacking more throwaway cardboard characters, but not much of it takes place on the island. Bryce Dallas Howard returns as Claire (minus the blatant sexism that was tossed at her character last time around), now an anti-extinction activist, since the dinosaurs on Isla Nublar are in danger of being wiped out by an active volcano. I’m not sure exactly why there’s a whole lot of sentiment towards trying to keep them around, given all the catastrophes they’ve caused over the course of this franchise- I think I’m with Ian Malcom on it, who returns for bookend scenes in this one to argue once again for allowing nature to take its course (they never listen to him in these). But Claire wants to save the dinosaurs, so she recruits ex-boyfriend Owen (Chris Pratt), who inexplicably joins her in going back to the island to save the creatures, but what do you know, they’re tricked by an evil corporate villain (Rafe Spall) who wants to kidnap and sell the dinos as weapons instead, and now they’re all trapped in the mansion of Sir Benjamin Lockwood (James Cromwell) the until now never before seen or mentioned partner of Richard Attenborough’s late John Hammond, with the dinosaurs trapped in cages underneath the house. Most of the movie actually takes place in the house strangely enough, with Claire and Owen running around attempting to save their favorite monster pets while the bad guys get picked off by them. As always in a Jurassic Park movie, there’s a kid, this time’s Lockwood’s mysterious granddaughter, and the inherent silliness of it all (the Indo-Raptor knows how to fake his death and actually smiles before he eats people) makes it sort of mindlessly watchable, but also predictable. That is until the ending, which sets up a new reality in which somehow dinosaurs and man must coexist on the streets of civilization, which is so nuts it’s almost laughable but I guess makes for an endless future of sequels to follow. The thrill and the shock of dinosaurs wreaking havoc onscreen is long since gone for me (it really hasn’t been there since the very first Jurassic Park), but the continued box office success of this series shows that audiences clearly disagree, so I guess we’re in this new Jurassic World for the long haul. 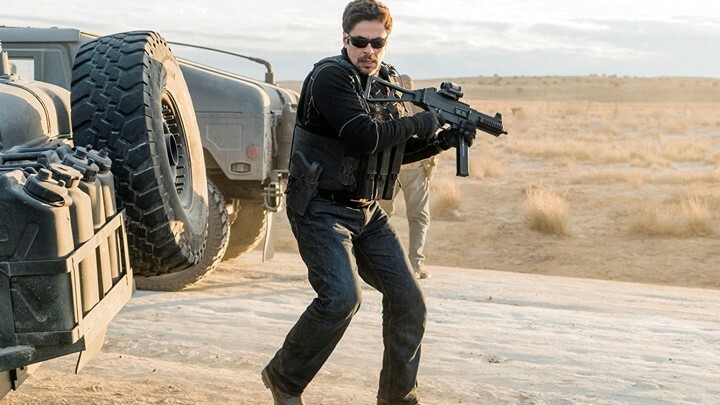 The original Sicario was a kind of mixed bag for me, but what undoubtedly made it worth seeing was Benicio Del Toro’s outstanding performance (should have been Oscar nominated) as the stone cold assassin whose family was murdered by the cartel, and who takes his revenge in a climactic sequence that left you breathless with suspense. The sequel erases Emily Blunt’s FBI agent from the first film (which is for the best, storywise), and gives Del Toro’s Alejandro Gillick a bigger role, but the plot is slightly muddled and confusing, as we have to figure out exactly what’s happening as it goes along, given that the original mission of starting a war with the cartels is instantly disastrous and then dispensed with. The Sicario series, as it is, is not exactly your standard action movie franchise. Josh Brolin’s American black ops agent is impossible to root for and he still takes up too much screentime, as the foiled U.S. plot must be discussed and explained in full. But every scene (and there are more this time) with Del Toro is compelling and gives the movie its energy. I wanted him to be the star of a Sicario sequel and this one still refuses to let him take over completely. But his side mission to save the life of the teenage daughter (Isobela Moner) of his enemy is engaging and the incredible final sequence where Gillick displays his badass nature in a completely different way from the first, while mirroring the timing of that final feat feels like yet another triumph for this unstoppable antihero. But if there’s going to be another one, can he please be the lead now? Why sideline the most compelling character and actor of your action franchise, who is the sole reason for the success of these films? The sequel to 2015’s Ant-Man is every bit as silly and inconsequential as the first, which to some people makes this series one of the most delightful of Marvel’s ongoing sagas, and to me their most dreadfully boring. 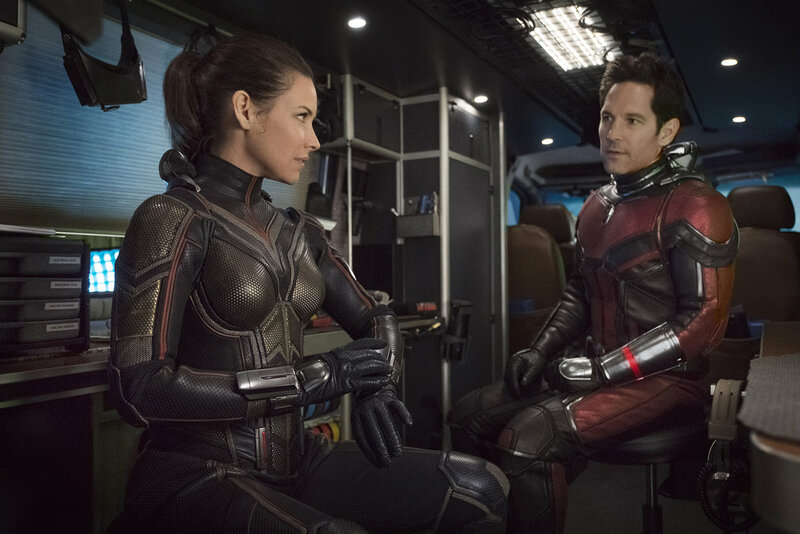 Paul Rudd returns as ex-con Scott Lang, who’s been under house arrest for his part in the events of Captain America: Civil War (this movie takes place right before last May’s Infinity War), and is now recruited back into the suit by his ex-girlfriend Hope Van Dyne (Evangeline Lilly) and her father Hank Pym (Michael Douglas) in their quest to retrieve his long lost wife Janet (Michelle Pfeiffer, digitally brought back for a moment to her early 90s face, along with Douglas and Laurence Fishburne) from the quantum realm, where she’s been floating around for the last thirty years. This goal is jilted by a couple of villains who are out to steal Pym’s tech for themselves, including Jusitified’s Walton Goggins and Game of Thrones’s Hannah John-Kamen, but every meaningless action scene feels perfunctory and un-amusing. The shrinking and enlarging cars, suits and buildings do nothing for me in these movies- there’s just no real stakes involved in any plot that Ant-Man gets caught up in. The meant to be entertaining antics of Michael Pena and co. are a mild diversion at best, and the potential for this movie to be Marvel’s first real romance/partnership (implied by the title) is all but totally ignored, as Lilly gets a couple of action scenes in the Wasp suit, but once again comes completely devoid of screen presence or a personality as the movie’s straight man. I don’t love the Guardians of the Galaxy movies either, but even those have more flavor and character to them than these mild, bland, utterly paper thin adventures. I never thought I would suggest looking back to the Honey, I Shrunk the Kids franchise for more creative suggestions on what to do with the idea of shrinking as a concept (which does have potential! ), but these guys could use some tips. Writer-director Bo Burnham has crafted a different kind of coming of age story, one that places you largely inside the head of 14-year-old Kayla (Elsie Fisher), an awkward, quiet, anxious middle-schooler as she struggles to fit in with the other kids and find her place in the world. It’s a delicate, highly realistic look at the modern world of teens, who pretty much live on their phones, and that’s not even a metaphor. Kayla does live in the online world of instagram and snapchat, etc., and she uses her youtube channel as a kind of diary to communicate in the way she wishes she could with those in front of her. Fisher is outstanding as the shy, introverted Kayla, and Burnham displays a real talent for conveying the internal world of a young person in highly intimate terms. There’s no real plot to speak of, just episodic events in Kayla’s life, as she embarks on the last week of middle school, none of which are too dramatic in reality (except for one harrowing encounter with a predatory high-schooler), but to an eighth grader it’s the whole world and it feels overpowering. It’s an impressive debut for both director and star, even if treading on familiar ground. October 14, 2018 by Ariel Shavonne.